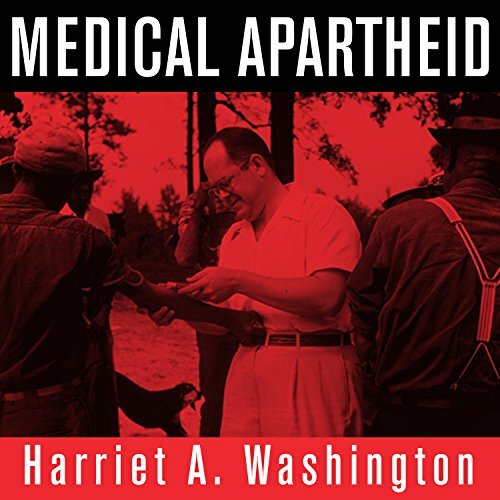 Medical Apartheid is the first and only comprehensive history of medical experimentation on African Americans. Starting with the earliest encounters between black Americans and Western medical researchers and the racist pseudoscience that resulted, it details the ways both slaves and freedmen were used in hospitals for experiments conducted without their knowledge - a tradition that continues today within some black populations. It reveals how blacks have historically been prey to grave robbing as well as unauthorized autopsies and dissections. Moving into the 20th century, it shows how the pseudoscience of eugenics and social Darwinism were used to justify experimental exploitation and shoddy medical treatment of blacks. When I listened to this book, I immediately had a better understanding of my father's hesitancy to go to the doctor during his last 20 years of life. Chock full of FACTS from medical and government records and reports, as well as interviews with survivors, this book hits you in the face with deliberate atrocious acts against people of color by those sworn to "First do no harm"... and covered up by those sworn to protect and serve. It exposes greed by the many, action by very few, inaction by many in the justice system, and malice by many in the legislative system. It is an EXCELLENT read. Very sad and very sobering, but speaks volumes to what can happen when a human being does not value the life of another. Author composed this book so that it is interesting. I loved the way the book was composed, because it made for interesting reading .... Stuck to her main goal of encouraging African American people to research medical studies and to join them if deemed worthy. Jam-packed with eye- opening human experimentation that should never have been done on anyone. Although I think there is still human experimentation going on that should not be going on. This book was a challenge. Not because it was hard to follow, but because of the information that's provided. Discovering true American history is daunting. But well worth the journey. I am an American with African, European and some other flavors thrown in. I was sickened and brought to tears to learn how my people were treated and how human beings are pure evil. You are so right about educating ourselves on what is needed to survive. This book is full of information that is surprising, horrific, amazing, shocking, and educational.No wonder the meek will inherit the earth., they deserve it. Excellent, I knew African Americans had been used as experimental subjects, but never to the degree discussed in this book. Additionally, the use of new drugs used, particularly on Africans is alarmingly and inhumane. It is my hope for 3rd and 2nd world countries and their leaders to take a more progressive stand for their people. What a rich read, full of important facts and excellent contextual framing. As a public health professional, I was surprised to find out how much of the information in this book was omitted from my education. I feel as though his book should be an essential read for all public health and clinical professionals. Without understanding the history, there is no path forward. Awesome! Well written, comprehensive and informative. The narration is great. We need this information. Well done! the material in this book was mind-blowing. this should be a medical ethics reading requirement for health care professionals when going through their training program.